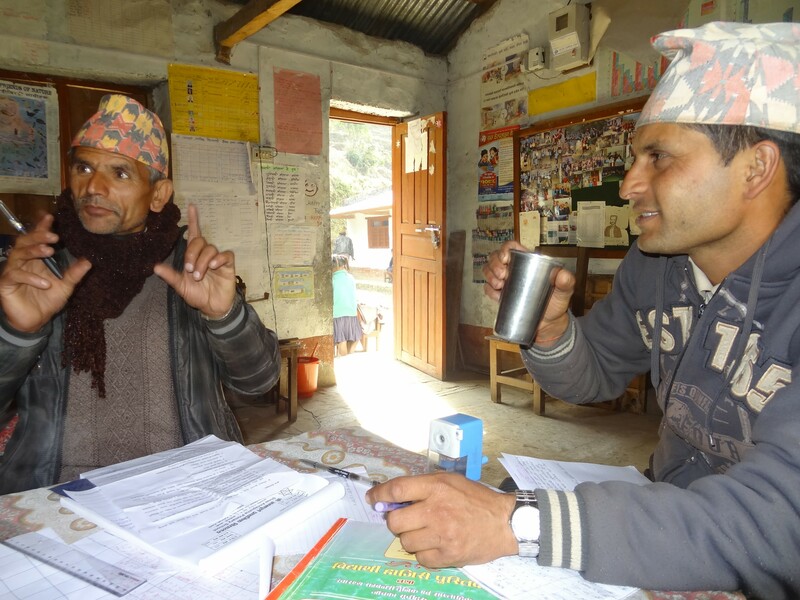 From the little experience I have had of other village schools in Nepal it is already clear how dedicated the headmaster and teachers are in Kalimati. They have no more resources than any other school and from what i have seen a case of a lot less. But they really care and do the best with what they have. Pasha told me that the kids from Kalimati eventually go to Ghalel for secondary school years and they are always the top kids in the class in Ghalel. Danda Pani is the headmaster, Deepak and Shova (pictured) take classes 3, 4 and 5 between them. They are the only paid teachers, mothers from the village Bishnu and ?? take the younger classes. The school office is full of posters and pictures tracking progress in the school. Behind the door hangs a set of toothbrushes, one for each child – first thing in the morning after roll call, everyone lines up with their toothbrush to get a squidge of toothpaste and are sent off to the tap to brush teeth. The teachers asked if I could get whiteboards for the classrooms, they use chalk and painted blackboards on the walls. The reason they gave was the chalkdust in their lungs. which i have to say made me laugh and pointed out that the dust from the road is way worse and the more likely cause of any breathing problems. Plus the cost of whiteboard markers prohibitive once they have run out. However I soon changed my mind when sitting in the back of one class i realised it was impossible for the kids to read what was written on the blackboard with the shine and poor chalk. So another trip down to Pokhara and a hunt for 6 large whiteboards. I also bought a couple of small portable ones which Deepak quickly put to use, taking the kids to sit outside on the rice terraces.